The quantities of salt applied to area roadways and sidewalks during the winter of 2013-2014 was among the most in decades, given the long cold, icy,and snowy periods, which ran relentlessly from November through March. While the repeat or heavy salt applications certainly enabled us to traverse our roads more safely, the damage to plants and turf grass is a most unfortunate byproduct. Clearly turf grass adjacent to roadways was damaged. Trees and shrubs near the treated roads were often covered in salt since salt spray travels some distances. Salt, in a word, dehydrates (and can kill) plants. Salt is composed of sodium and chloride, both of which are toxic to plants in high concentrations. When salt dissolves in water, the sodium and chloride ions separate, and the sodium ions in the salt replace other nutrients in the soil that plants need (potassium, calcium, and manganese), making these nutrients unavailable to plants. Rock salt absorbs the water that would normally be available to roots, thus dehydrating the plant roots. This changes their physiology and causes additional plant stress. The chloride ions that are absorbed by roots are transported to leaves, where they accumulate and interfere with chlorophyll production and photosynthesis. Further, when passing vehicles spray salt on plants, it can damage a plant’s leaves, buds, and small twigs, which in turn can reduce the plant’s cold hardiness, making tissue more susceptible to freeze damage. Salt injury symptoms resemble drought or scorch stress. Foliage can yellow and look stunted. Leaf margins may turn brown and curl. Damage becomes evident through spring as new growth starts. Evergreens react more rapidly to salt injury. 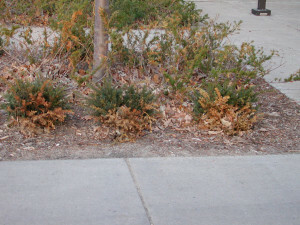 Conifer needles will turn yellow and brown. If plants suffer leaf or needle damage only on the side of the plant facing the roadway or sidewalk, then salt damage becomes obvious. What to do about salt damage? If you have valuable plantings close to streets or other areas pelted by salt products, you can try to flush the areas with water (or, in the future, pile clean snow onto the area if that is still around). A soil test can be conducted to indicate the actual soluble salt content, and if it presents above specified limits, gypsum can be applied to soil under the root zones of trees and other affected planted material. This will help move the sodium through the soil. If plantings near areas affected by salt have not survived, it would be prudent to replace them with plants that have reported salt tolerance in order to prevent a recurrence. Deciduous planting may work better adjacent to roadways. Some local jurisdictions that operate salt trucks are willing to reseed damaged turf grass. (Unfortunately, this would be done in the spring, and reseeding is best done in the late summer/early fall, but it is worth a try). 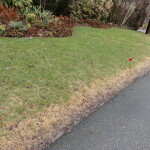 Alternatively, the homeowner can re-sod the area that contains damaged turf grass. Be mindful that healthy plants can withstand salt injury more readily. Therefore, it is imperative to always prepare the soil properly for planting, and to provide ample watering and nutrients (if needed) to promote plant health.